Benevolence movements in antebellum America were a way for Protestant women to shape culture in a nonconfrontational, indirect way. These organizations began from a variety of personal and group motivations. Of course there was genuine care and concern for the needy. But there was also a certain anxiety about living in increasingly urban environments that contained ever larger numbers of the poor. Add to that the community minded who saw the lower edges of society as a drag on the economy and public culture. It’s not clear how the Nauvoo Female Relief Society fit this framework but one has to assume that different members saw it in different terms. The obvious difference was the quasi-priesthood aspects of Relief Society. The Once and Future Book: Steven L. Peck’s “A Short Stay in Hell” returns! Fellow blogger, applied mathematician and BYU faculty member Steven L. Peck’s stunning little book “A Short Stay in Hell” is now on sale. Go thou and buy it. What is eternity? Shiver. Here at the CHL, waiting for the festivities to start. I’ll add things as they happen. So here we are on the 4th floor of the CHL, waiting for things to start. I’m listening to Ardis type on her cool bit of tech — she’s like a machine gun compared to me — you know, fast. Mark Ashurst-McGee putting out the originals. iphone lens is dirty, sorry. Matt Grow welcomes. JS histories from 1832 to 1844. Having some technical difficulties. Mark: Originals on the table. Richard Jensen: revelation — a record is to be kept among you. Oliver Cowdery, David Whitmer and finally John Whitmer asked to keep records. JW asked to do history, but reluctant to do so without a “commandment” — (a revelation of obedience). JS, working with Frederick G. Williams puts together a short retrospective. Others involved: Phelps, Partridge, Corrill, Cowdery, First Presidency. Volume 1 of Histories focuses on documents where JS has involvement. History drafts that somehow had JS oversight at least. Mark showing JS letter book one. Contains JS’s first retrospective history. 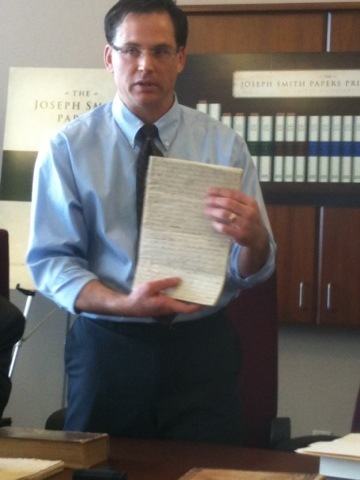 Mark shows 1838 draft history. Looks like a gathering torn out of a book early in 1833, turned it inside out and started writing in 1839. Copied into book used for 1834-36 history (turned upside down and backwards first). Became volume A-1 and source for Times and Seasons serial history. A-1 has more stuff (via Willard Richards) than appears in T&S. 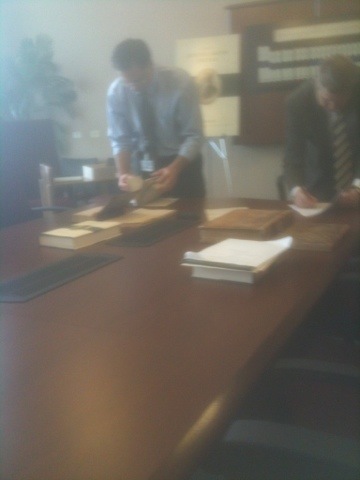 Mark shows a copy of Rupp, Orson Pratt’s “several remarkable visions” Howard Coray’s deadend workup, other stuff. What value does “Histories” add? Use of originals, various technologies, to get best version they could. Doc analysis in the volume is new and important. Editor Karen Davidson: Coray Fair copy A-1 in First Presidency vault. Either JS or Coray decided to shorten and be less defensive and hostile. Coray stuff is a major bonus. Differences between Rupp and Wentworth. Just before he died, JS saw Rupp’s book. Importance of Pratt’s several remarkable visions in writing of Wentworth and Rupp. Charts: docs, scribes, coverage, dates produced. There’s a Stemma! YES!! Life is good. Nathan W. A year from now all of H1 online? Other stuff within a week or so. Coray draft copy (in H1) and fair copy (not in H1) will be online. Mark and others answer various questions from trouble makers like Jonathan Stapley. One of the most interesting things in the presentation to me was the probability that the 1832 history used a precursor manuscript. I’m guessing a reconstruction might be done. Just guessing. Here's a graphic of the projected printed volumes. Note a second oversized volume. Excellent stuff forthcoming. I thought some of you might be interested in some recent stats for BoAP.org (no not this blog). Here’s what happened so far this month: March 1-18, 2012. Mary-Jo Kline’s A Guide to Documentary Editing has been a standard for years. Even in earlier editions of the book she noted the coming of the the e-edition and despite all the questions of permanence, distribution and accessibility, it, and its associated new techniques, will be a dominant force in the world of editing. I think it’s possible that it will replace print in that genre. The recent announcement of Scholarly Editing in electronic form only and by necessity the same for its content shows how far we have come. New editing software based in html, xml, LaTeX and so on brings both new and old formats to bear. I like a wonderful cloth-bound-quality-paper book as much as the next person. But the day of low demand dense textual scholarship finding an exclusive place in that format seems to be at an end. Better get used to it folks. With much of the grub work on chapter 10 of the book nearly finished, I’m contemplating what might come for publication. There is still considerable work ahead in checking documents, fleshing out sermon edition notes and then there are formatting issues I’ve put off in a few of the later chapters <grin>. What is the future then? I’ll probably try shopping some chapters around. But there are matters I don’t want to compromise on. One of those is formatting and facsimiles. To say nothing of color. I wonder. In the meantime, over at BCC I’ll have a pre-conference series running: The Presiding Bishopric. Starting on the 18th and running about every two days in 6 parts. 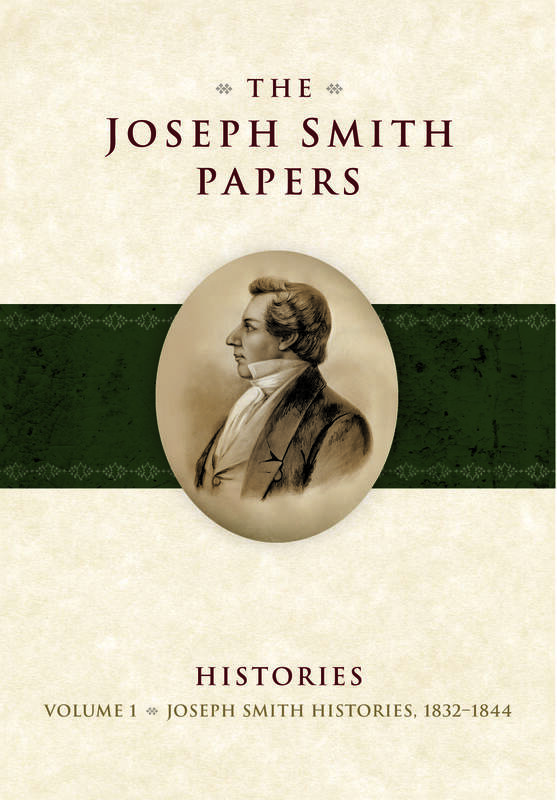 It has some fun stuff from the Joseph Smith Papers.